Blocoware iPhone and iPad Apps: Issue with iPhone/iPad GPS? Lets fix it! What you can do in case when GPS in your iPhone or iPad is not working properly? I'm an author of a GPS app - "Speedometer - Speed Limit Alert and Trip Cost Monitor" and I've witnessed cases and issues with my customers that have built my quite solid "GPS issues" knowledge base. Let me share. Despite of some old images in this article, it is being updated constantly (last update is January 31, 2018 with OnStar interference with iPhone 8/X). Step 0. iOS 11 user? Upgrade to the latest iOS 11 version as Apple keeps fixing GPS issues with each iOS 11 update. You can read on previous issues here: https://discussions.apple.com/thread/8112686?start=60&tstart=0. Please don't forget to restart iPhone one more time after the update. Step 00. Disconnect your iPhone or cellular iPad from USB/Lightning and exclude other sources of interference. To keep the experimenting clean, please plug off your iPhone from USB/Lighting. This will help to avoid cases of charger or car location system interfering with the iPhone's location system. [Update 11-Jan-2018] If you have a Tire Pressure Management System (TPMS) in your car, it can interfere with GPS receiver in the iPhone. Problem identified by Flavio from Brazil and with his permission I'll be writing more about this problem soon. Looks like because of Qi wireless charging iPhone 8/X may let in frequencies that previous iPhones were filtering out before and this is interfering with GPS receiver. Please try to isolate this possible source of interference before you continue further. [Update 12-Jan-2018] From the forum above, again it looks like that there is some interference with iPhone X/8 GPS when you place iPhone near the central vents in the dashboard in Hyundai Sonata. If you own Hyundai Sonata, please just avoid positioning your iPhone near central vents. I begin thinking that maybe the OnStar is interferring with it (it has gps, calling, etc..) So i decide i'm going to start with that. I pull the fuse, we start the car and i verify the OnStar module on the ceiling isn't lit up with an led. We decide to go for a test drive. It follow us the entire way, no issues whatsoever. I tried it on my phone that screwed up too, flawless. TL;DR Pull the fuse for the OnStar module in your car if it has this. Worked for my issue. Step 1. Check if airplane mode is not ON. Generally, GPS receiver should stay working even when airplane mode is on, but let's better avoid being in airplane mode as we test further. Make sure that airplane mode is switched OFF. Step 2. Check if you have location services enabled. Location services enable iPhone/iPad to track your location either via GPS, cellular cells or wifi. In versions previous to iOS6 Location Services switch is located directly in the root page of the Settings menu. Step 3. Check if location services are enabled for a specific app. It may happen that you tapped by mistake on Decline/NO when specific app was asking for access to Location Services. If you tapped on Decline/NO, then this app would not be able to track your location. Tap on Location Services row in the settings and see if you have this app in the list and its access to Location Services is set to ON (or from iOS8 and higher, please check that is either "Always" or "When in Use", dependent on what app needs). Step 4. Power down/on cycle. Still no luck? Power down the iPhone or cellular iPad, wait for a minute and then power it on. This step freshens the GPS module and gives good chances that you'll see better location readings. How to power down your iPhone? This is described on this Apple Support page. Step 5. Deep HW restart. Step 6. Reset location and network services. Step 7. Clean iOS install. Step 8. Can it be GPS antenna? Any chance you had the battery replaced recently? Then the so called “flex” cable might not have been re-connected properly and GPS would not be working properly then. You might need then to revisit the repair centre and re-check on that cable. Even if there is nothing happened to suspect the faulty GPS hardware, just visit an Apple service center for a hardware check. If GPS antenna is to blame, it is only $20 cost and 30 minutes time to get fixed. That was it about basics! If you got to this point and location services are still not working for you, lets dive a bit deeper. A. Location services are not accurate and often the device/app can't locate me. If it locates me I can be off on map for hundreds of meters/feet. Remember that for the accurate location tracking a GPS signal is required. GPS may do its job properly only when you are located under the sky. If you are inside the building or between higher buildings, your iPhone/iPad may not be able to identify your position by means of GPS. What I can do? Get to the place where your iPhone/iPad can "see" the sky :), give it 10-15 seconds until the device will be able to read GPS coordinates properly. In a train, please be sure to move as close to a window as possible to give GPS receiver a better view of a sky. If it is a TGV/modern type of train, please note that they cover windows with a film that shields a lot of GPS signal away. B. When I'm on wifi I can see my location on the map, but if I'm not connected to wifi I can't see my location on the map. Be ready for a surprise! If you own iPod or a wifi only iPad, you'll get to discover that they don't actually have a GPS chip built-in. So they can get their approximate location when they are connected to a wifi. The accuracy of that location will never be better than 50 meters, and they loose the ability to know about where you are once you disconnect from wifi. Ok. Get some app to measure the GPS accuracy with. There are many, and of course I use my own :)! C. I've got a cellular (3G, 4G, LTE) iPad or iPhone (higher than 3G) and still no luck with accurate location readings or it can't locate me at all! 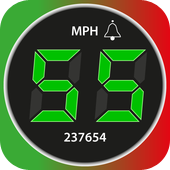 Here is a free version of my speedometer app in the AppStore. Downloaded? Disconnected from wifi? Lets go! to green with STRONG value. Please notice the value above GPSΔ (on main GPS panel), what does it show? Values below 30 meters (100 feet) will mean GPS receiver is functioning and has a lock on satellites. Around 60 to 100 meters (200 to 300 feet) feet will mean location is determined based on wifi. Above 100 meters (300 feet) - location is based on GSM cells triangulation. If GPS indicator stays red and tells OFF, then GPS receiver doesn't want to step in and provide high accuracy location. Please return to the start of this article and re-iterate over troubleshooting steps again to see what you could have missed. I hope it all works for you now by now as otherwise you are entering the shadow area of a possible hardware malfunction. This is probably the right moment to contact the service centre, don't wait until warranty expires! Now let me be a businessman :) and give you a link to a full version of my speedometer app. Which I believe might be one of the better ones :)! [Update 12-Oct-2013] One of our customers had this case on his iPhone and it proved to shield the GPS signal away: https://www.lunatik.com/products/iphone-5/taktik-extreme. Just be ware. The best way to test if your iPhone's case is breaking the GPS signal is to take it off and try without it. To troubleshoot this, just switch USB from the built-in USB charger to an external charger connected to a 12V plug or run iPhone without plugging to the power outlet at all for a minute to see if problem is not caused by USB interference. Subaru, really?! Cadillac owner? [Update November 3rd 2017]. It was a great troubleshooting with Jim from US who had Cadillac XTS 2017 rented and found out that actually plugging his iPhone to car's "direct USB" port made speed readings erratic. Everything worked alright with the "charger" usb port. [Update 20-Apr-2015] There is an issue with External GPS modules and iOS8.3 release. Most of module manufactures issued statements saying they know about the problem and reported it to Apple. As of the moment, until Apple releases the update, the only solution is to downgrade to iOS8.2: http://www.gottabemobile.com/2015/04/08/how-to-install-the-ios-8-3-update/.